Synopsis: Sammy Rice is a World War Two weapons researcher who is forced to lock horns with the army, his bosses and competing researchers as he seeks to find ways to shorten the war. Rice also has problems at home: he is an alcoholic with a false foot who is worried that his long-suffering girlfriend only stays with him out of pity. When the Luftwaffe start dropping a new and deadly form of anti-personnel bomb on Britain, Rice is presented with the chance to serve his country and boost his self-esteem into the bargain. 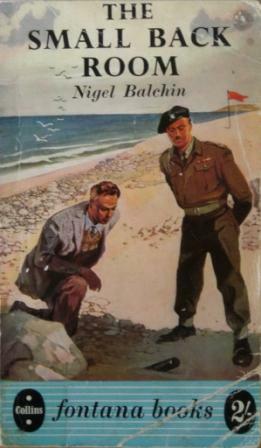 Context: Balchin worked for the army from 1941 to 1946. During his employment he was principally concerned with scientific research, rising by the end of the war to become Deputy Scientific Adviser to the Army Council. Verdict: Most good judges concur that this is Balchin’s greatest novel and who am I to disagree? The background is fascinating, there is a good mix of humour, drama and romance and the ending is thrilling and very lifelike. Availability: The Small Back Room was reissued by Orion Books as a ‘W&N Modern Classic’ in September 2015.